You might not believe it but it can be hard to find decent vegan and vegetarian restaurants in Hanoi. Use this post and print our map and guide to the best vegan and vegetarian restaurants in Hanoi to make sure every meal is a winner! 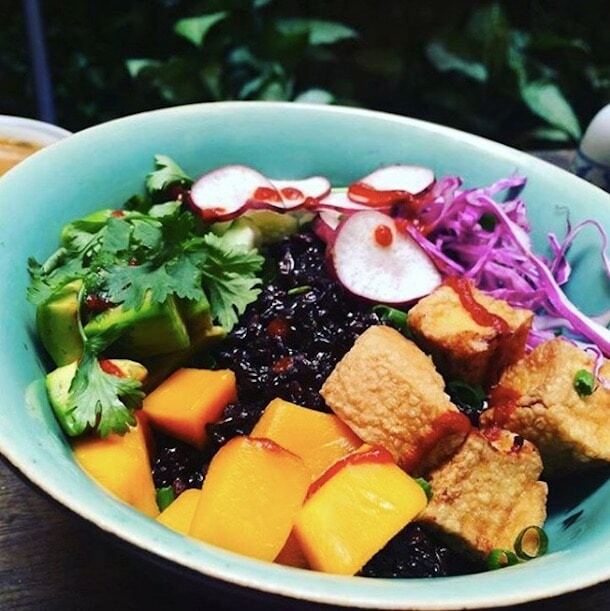 What’s in our Guide to the Best Vegan and Vegetarian Restaurants in Hanoi? You would think that in a city where fresh tofu, noodles, and every green herb under the sun abounds, finding animal-free restaurants in Hanoi would be a snap. But when I first got to Hanoi, I was frustrated and disappointed at almost every meal. It was just so hard to find good, inexpensive vegan or even vegetarian food in Vietnam and especially in Hanoi’s Old Quarter. Now, after almost three weeks staying in Hanoi, I have explored and found my favourite Hanoi vegetarian street food stalls, restaurants, and dessert vendors for vegetarian food in Hanoi Old Quarter. 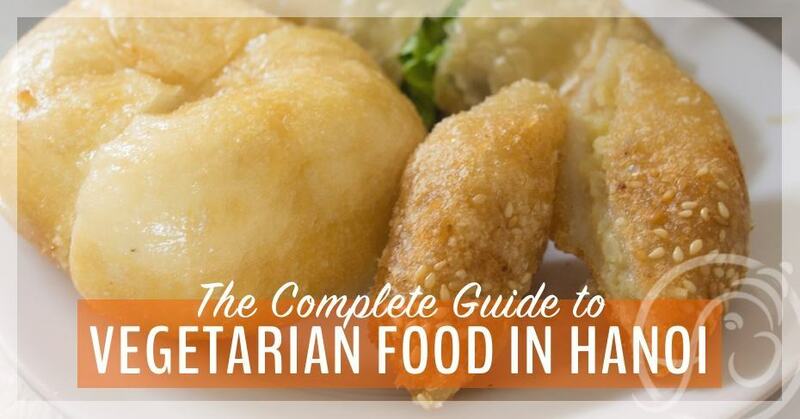 Before you read the post, grab your free printable guide to the best Hanoi vegetarian restaurants. It includes a map and the addresses of all the places I mention in this post! Jane’s note: Be warned, before you book your ticket to Hanoi, that vegetarian Vietnamese food sometimes contains fish sauce. I know, that makes it not vegetarian! I have noted which of my suggestions contain a few drops of fish sauce. If you can’t reconcile yourself to eating a tiny bit of fish sauce when you visit Vietnam, you will miss out on the best vegetarian Hanoi experiences. 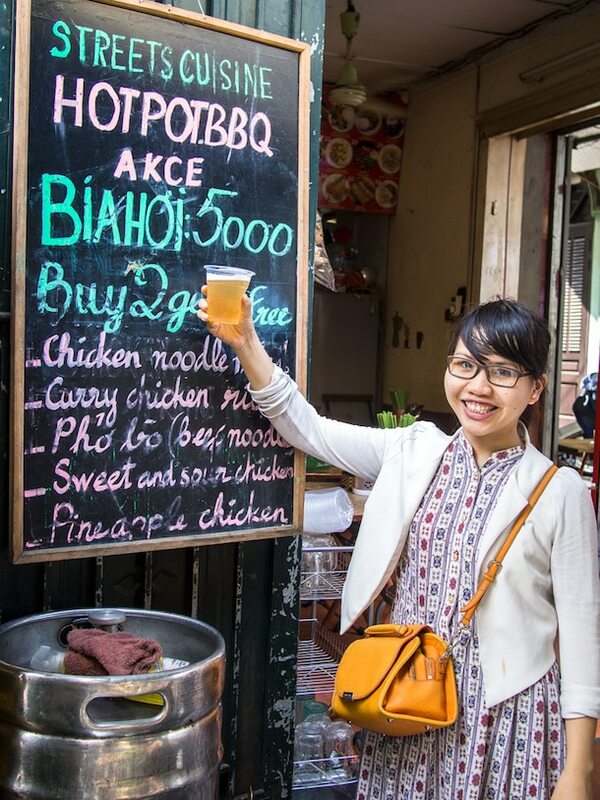 When Hanoi Street Food Tour invited me to be a guest on a vegetarian street food tour, I was beyond thrilled. 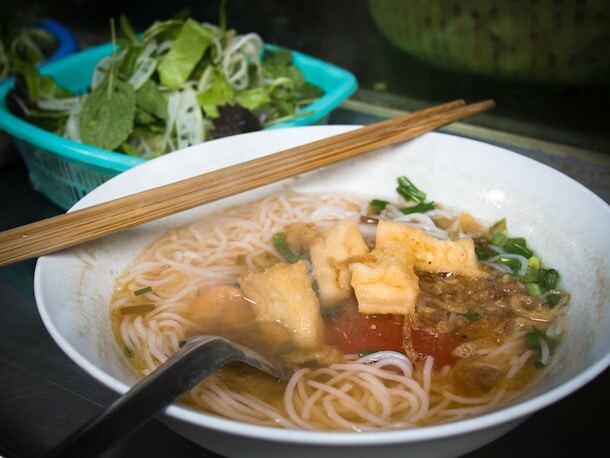 They are one of the most highly rated street food tour companies in Hanoi. But, I was a little worried, too. Would they be able to find enough food to satisfy my usually vegan and occasionally vegetarian (when there’s no other option) palate? The answer is an emphatic “yes” — as long as you are OK eating a few drops of fish sauce. 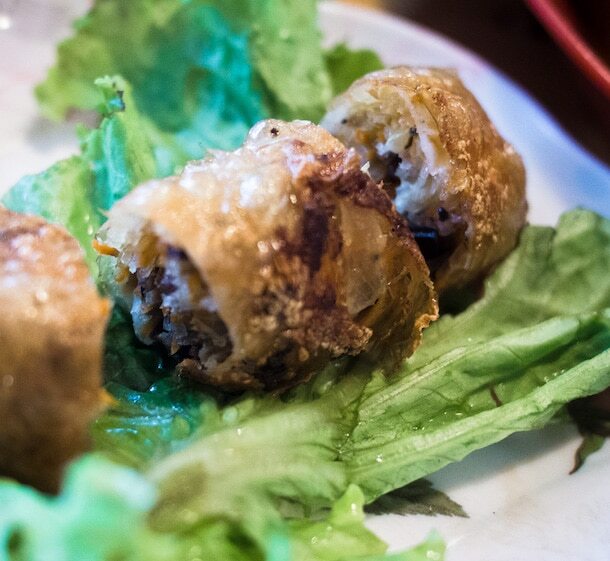 For vegetarians, a Hanoi food tour is a must-do on your first day in the city. It will show you where to look and what to eat while you’re in the city and introduce you to flavourful and delicious vegetarian foods you wouldn’t even know existed otherwise. To kick things off, Miss Moon took me to a place so tiny and humble, I would never have even noticed it on my own. On the wall next to the glass case displaying a large basket of tofu and herbs (plus some patties of I know not what!) hangs a simple red and white sign reading “Bun Rieu Cua”. Miss Moon explained that the name of the soup actually means “crab soup”, but it doesn’t have crab in it. Instead, she said, the broth in this Bun Rieu Cua is a zingy tamarind and tomato broth which is brought to life with a small scoop of red chilies, a spoonful of vinegar and a pile of fresh herbs. The tasty Bun Rieu Cua is possibly not all that vegetarian. However, a quick check online shows that Bun Rieu Cua broth is traditionally made with crab broth, so… you can decide whether to try it or not. After a few visits, I noticed that the woman serving the soup was cooking raw meat by adding it to a large ladle which she rested in the top of the soup pot. The meat didn’t go into the soup, but still… not the ideal vegetarian fare. On the plus side, this bun rieu cua is the best-tasting noodle almost-veggie soup I’ve ever had, so that’s why I’m including it here. Hanoi vegetarian street food ordering tip: Be sure to ask for “ăn chay” or “không thịt” before sitting down. Otherwise, they might automatically bring you their speciality dish, which will undoutedly include meat. Our next stop was a larger food stall with many signs indicating that meat was definitely the main attraction here. But, according to Miss Moon, they are also well known for their fresh, crispy papaya salad, which should be eaten at the beginning or the end of a big meal to help with digestion. This makes sense since papaya extract pills are a homeopathic remedy for digestive problems. I have had many papaya salads in my life but this one was memorable. 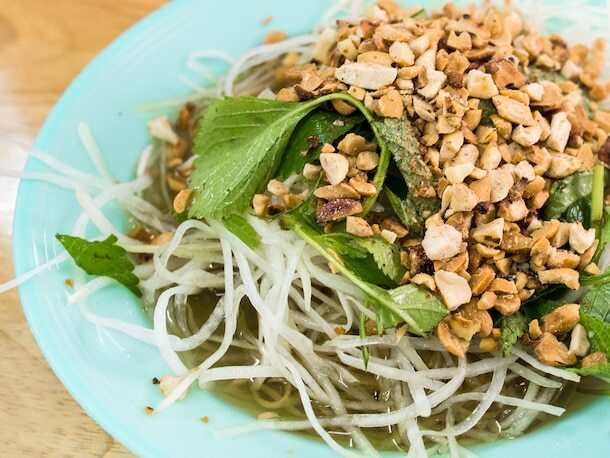 Atop the pile of crunchy shredded papaya was a good quarter cup of crushed roasted peanuts and a generous portion of leafy green herbs. Fresh papaya salad piled high with peanuts. The sauce is where things get a little sticky for vegetarians. It contains equal parts honey, rice vinegar, and fish sauce. As I said, if you want to eat authentic Vietnamese food in Vietnam, you will eat some fish sauce. Make your peace with that before you book your flight. With my tummy prepped by the papaya salad, we were ready to move on, over to the west side of Hoan Kiem. Here, we found yet another unlikely looking stall. Outside, a woman was dipping into a big bowl of what looked like paper maché paste and then spreading it thinly atop a drum skin. Banh Cuon is prepared on a silk skin above steaming pots of water. 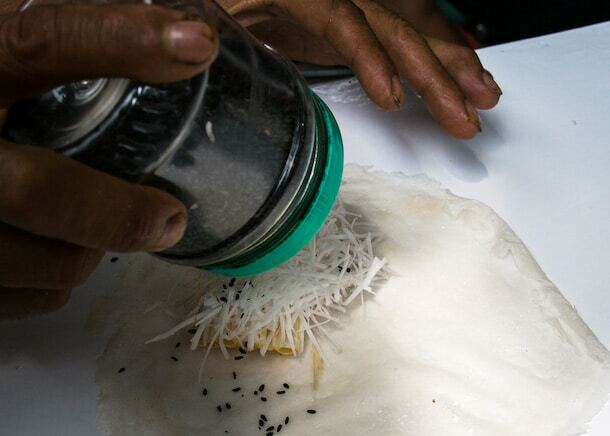 In reality, the thin batter is a combination of fine rice flour and water, the basis of Banh Cuon. Banh Cuon literally means “steamed bread” and this is exactly what was happening. The cook spread the thin layer of batter onto a porous silk skin which is balanced above a pot of boiling water. The steam rises through the skin and cooks the fine circular noodle, the size and shape of a pancake — but much thinner. Finally, the cook scrapes the noodle from the skin and adds it to the sticky pile of noodles. Banh Cuon is simple and surprisingly tasty. For vegetarians, the noodles are topped with a layer of crispy fried shallots. For everyone else, pork is added as well — so you need to order yours “ăn chay”! As with most foods in Vietnam, the toppings are as important as the body of the dish. Banh Cuon is paired with a sauce of rice vinegar, water, and (yup, you guessed it) fish sauce. Thinly sliced kohlrabi is added for a bit of crunchy freshness and the de rigeur basket of herbs adds the final touch. If you’re looking for the KFC of Vietnam, says Miss Moon, look no further than Quan Goc Da, or the banyan tree restaurant. This large food stall, just a block or two west of Hoan Kiem lake, is almost always hopping with locals and tourists. At dinner time it is almost impossible to get a seat. Tasty fried breads in Hanoi. Their speciality, as you may have guessed from the title of this section, is deep-fried bread of every description. For vegetarians, you have at least three options. The pillow cake comes stuffed with noodles, mushrooms, and fresh lettuce (which magically remains crispy even after being in the fryer). 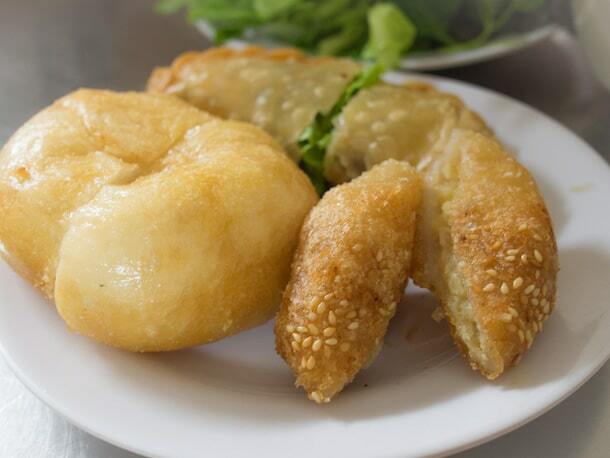 A plain dumpling, fried in coconut oil, is like a less-sweet version of a Western-style donut and the sesame seed-encrusted mung bean donut is a dense bread filled with sweet yellow mung beans. When I returned a few days later, I was told that there were no vegetarian pillow cakes, so check before you order. Hanoi traveller’s tip: When walking around Hanoi, you will be offered donuts from women carrying baskets along the streets. I’m not going to lie, they look delicious, and the first time I was in Hanoi, I ate them a few times. They were really good. However, Miss Moon says these are just-for-tourists donuts that the locals don’t eat since they suspect the oil being used to fry them is low quality and not fresh. By the time we reached Bun Cha Ta, a restaurant I had already discovered on my own, I was beyond full. I begged Miss Moon to just order a small tasting plate of spring rolls, knowing that I could never eat even half of what they normally serve here. Crispy fried nem chay come with noodles to make a full meal. She obliged, but also came back with a full serving of tomato tofu! For vegetarians traveling in Vietnam, tomato tofu becomes familiar very very quickly as it is often the only vegetarian food available in smaller towns. Despite my overfull belly, the tomato tofu at Bun Cha Ta tasted delicious. I headed back a few days later to try it again, and I have to say it is one of the best tomato tofu dishes I’ve ever tried. The Nem Chay (or vegetarian spring rolls) are also delicious. The are served with a plate of noodles, a basket of herbs and lettuce, and a large bowl of clear hot soup dotted with small islands of fresh papaya and raw carrot. To start, add some zing to the soup with herbs, vinegar, and chilis. Then, take a chunk of the cold noodles and dip them in the soup. Finally, one by one, dip the crispy fried spring rolls into the flavourful soup. Bun Cha Ta is not really street food since it’s an air-conditioned sit-down restaurant. It’s a great choice if you want to get off the hot noisy streets of Hanoi for a while. P.S. Yes, the soup does contain fish sauce. You just can’t avoid it! No food tour in Vietnam would be complete without a sampling of Banh Mi, but dammit, by this time, I was far too full to even think about eating something that substantial. I begged Miss Moon to let me skip the banh mi and she obliged, not wanting to witness an explosion of my food baby. But, she did educate me about the varying styles of banh mi in Vietnam. In the south, she said, banh mi is a meal-sized dish, stuffed generously with slices of pork, lots of pickled veggies and great slatherings of sauce. In the north, banh mi is a more modest snack-sized affair, with less sauce and fewer ingredients. I’ve often wondered why I have never been able to find the unusually fluffy banh mi baguette outside of Vietnam — French baguettes are far chewier. Miss Moon told me that in Vietnam, where they do not grow wheat, baguettes are made from half wheat flour and half rice flour, giving it the unique fluffy yet crunchy texture. In Hanoi, it’s tough to find vegan banh mi, though an OK one can be had at Pateta (at the corner of Ma May and Dao Duy Tu). 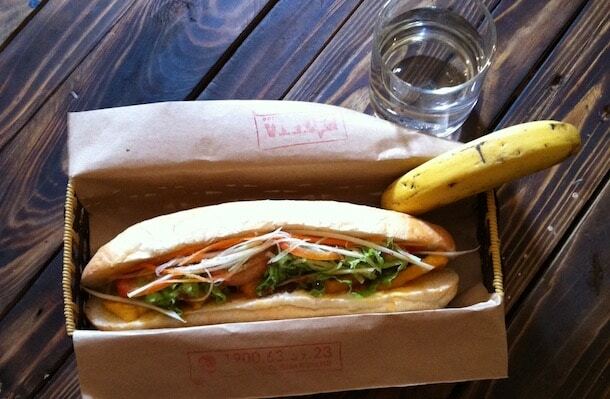 Banh Mi Pateta has not one, but two vegan banh mi options! However, if you want vegetarian banh mi in Hanoi, with fried or scrambled eggs, they are available at many of the banh mi stalls dotted around town. Try the popular Banh Mi 25 on Hang Ca, or just look for the word “trung” (which means egg) and be sure to specify “không thịt” when you order. 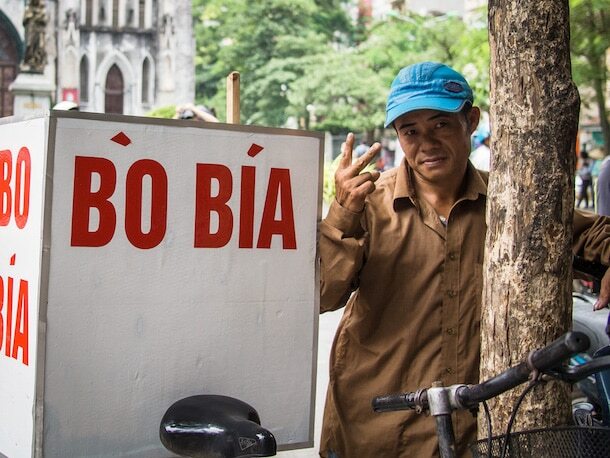 If you’re like me, you’ve noticed the bicycles rolling around Hanoi with a steel box on the back marked “Bo Bia” and thought “what the heck is beef beer?” Well, as it turns out, Bo Bia is a joke to make the tourists curious. What’s inside that little box is far more appetizing. If you’ve ever wondered what Bo Bia is, now you know. If you’re in the mood for a sweet treat, seek out the gentleman in the picture below. According to Miss Moon, not all Bo Bia is created equal and this man makes the best one in town. If he’s not close by during her food tours, Miss Moon skips the Bo Bia altogether — that’s how much she likes his product. This is your man for Bo Bia in Hanoi. The base is a corn flour wrap, thin and stretchy, like rice paper. Next comes a layer of crunchy fried sugar cane, a healthy portion of freshly grated coconut, and a sprinkling of black sesame. Wrap it all up and you have a little tube of yum. As a traveller in Asia, I often find that I don’t get nearly enough fresh fruits and veggies. That problem has been solved by my new favourite Vietnamese food, Hoa Qua Dam, or mixed fruit salad. But it’s not just a pile of fruit served in a bowl. Oh no, trust the Vietnamese to elevate even the humble fruit salad to a thing of decadence. Miss Moon took me to a stall where she says the fruit is always fresh and cool, making it popular with locals and tourists alike. Cool and refreshing fruit salad from a Hanoi street stall. 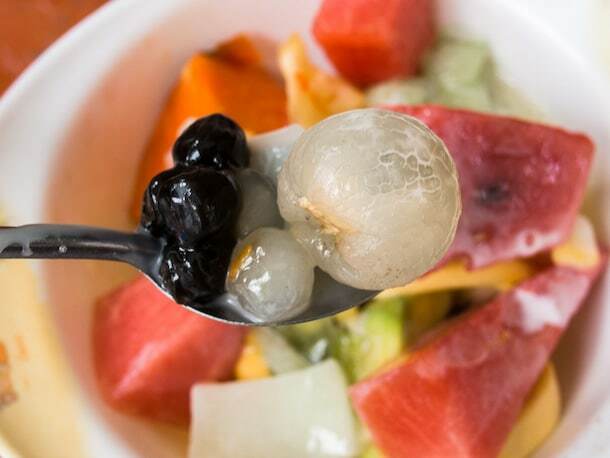 The fruits in my bowl included banana, watermelon, papaya, honeydew melon, jackfruit, longan, and avocado, plus a dollop of tapioca beads like you get in a bubble tea. This is all topped with a generous mixture of coconut milk and condensed milk, creating a sweet creamy sauce. It is served with a separate container of crushed ice, which you scoop out and mix into the bowl of fruit, chilling everything down to create the most refreshing dessert you’ve ever eaten. Hanoi traveller’s tip: You may be worried about eating ice in Vietnam since you’re not supposed to drink the water here. Most established restaurants and food stalls in Vietnam use manufactured ice from industrial suppliers, which is made from potable water. If the ice you’re served is a tube with a hole in the middle, then it’s safe, industrial ice. Of course, crushed ice is usually questionable, but Miss Moon assured me that the ice at the Hoa Qua Dam stall we went to is made from bottled water. Miss Moon models my glass of fresh beer in Hanoi. After reading about egg coffee, a Hanoi speciality, it’s not something I was ever tempted to try. Vietnamese coffee is either too bitter or too herbal for my taste and eggs just don’t seem to belong with coffee. Also, as a rule, I don’t eat eggs. But, in the name of research, I got over my hang-ups and agreed to give egg coffee a taste. It’s appropriate that egg coffee came last on our tour, as it is far more of a dessert than a drink. It all starts with a small cup of brewed Vietnamese coffee. 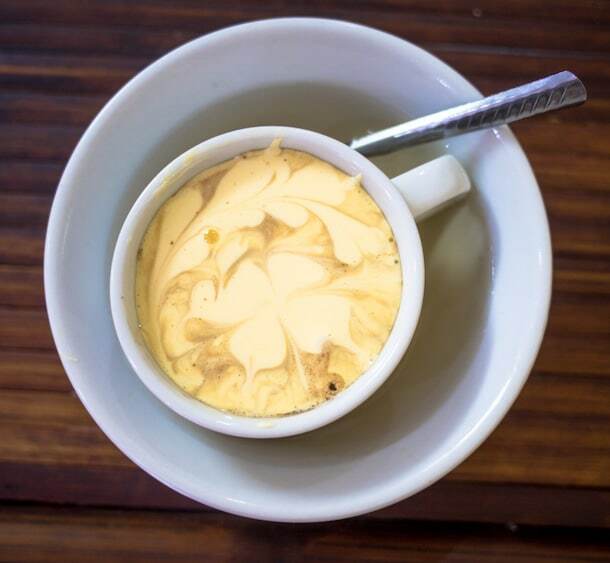 Then an egg yolk is mixed in a frothy frenzy with sweetened condensed milk until you have a fluffy topping which is plopped on top of a cup of dark syrupy coffee. Before drinking, stir vigorously to make sure the coffee and the egg mixture are well combined. Egg coffee is definitely not for vegans. Miss Moon warned me that not every egg coffee in Vietnam is created equal. She said that some vendors use duck egg instead of chicken egg, because duck eggs are cheaper. This leads to a less fatty and creamy coffee, since duck eggs don’t contain the same level of proteins that are found in chicken eggs. Also, some vendors use regular sugar instead of condensed milk, another way to make the drink cheaper but less creamy. When made the right way, egg coffee is creme brûlée in liquid form. Maybe not an everyday treat, but definitely something to try at least once on your travels. Look for a small, nondescript certificate on the vendor’s wall. The certificate means that the vendor is recognized as a safe (and delicious) place to eat. The certificates are not awarded to very many places though, so they can be hard to find. Look for places busy with lots of Vietnamese people. Check out what other people are eating — if there’s tofu or veggies, you can probably get something vegetarian, or close to it. You can also point to other people’s meals when you are ordering. Learn to pronounce the phrases “tôi ăn chay” and “không thịt” and keep a card with the written words handy so you can show it to the vendor. Be sure to stipulate “no meat” before you order. Even the tofu stalls often serve a plate of meat alongside their noodles and tofu. 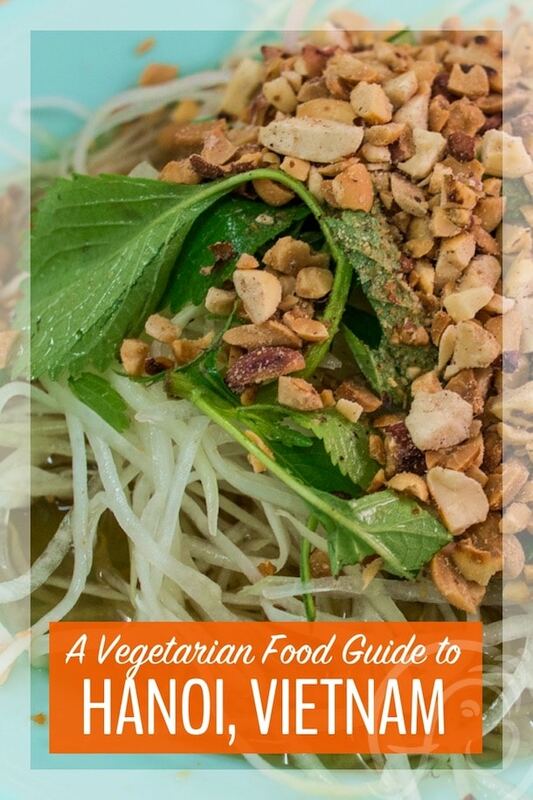 Grab your free printable guide to Hanoi Vegetarian food. It includes a map and the addresses of all the places I mention in this post! I’m not always in the mood to sink myself onto a low plastic chair and eat to the tune of a million scooters honking their way through the streets, so I have also sampled a wide range of vegetarian dishes from restaurants in Hanoi. 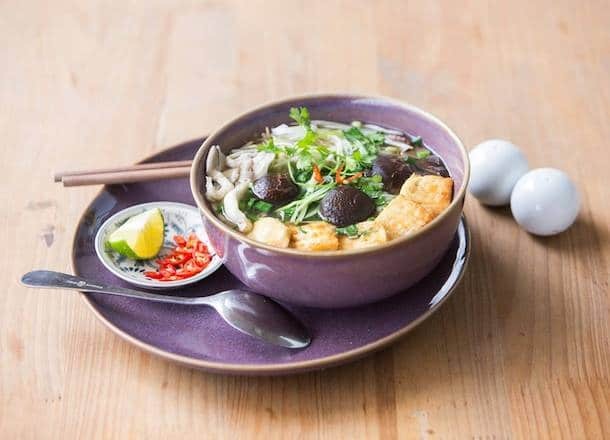 While there is not a great selection of veggie-only restaurants in Hanoi, many of the top-rated restaurants in the Old Quarter feature a few tasty veggie dishes. These are some of your best options when looking for vegetarian restaurants in Hanoi. There seems to be a vegan restaurant just like Jalus in almost every city in the world: second floor, quiet as the grave, natural wood tables and one bored staff member to serve you. On my first visit, I had the taco salad which consisted of fresh slices of peppers and cucumbers doused in chills and garlic and then wrapped in what I suspect was a rice flour tortilla. It was nice to have some fresh veggies, but the salad was just OK.
Jalus Vegan Kitchen is a good place to get crispy, fresh salads. I went back a few days later and had the pumpkin burger, which was a squishy mess, served on a disappointing bun. Still, I may have to go back one more time to try the vegan Vietnamese coffees and dessert. Update: Unfortunately, the central location of Zenith Yoga has closed but you can still eat some scrumptious vegan and vegetarian food at their Tay Ho location at 2nd floor, Westlake Suites Building, No.99B, 2715 Au Co, Tay Ho, Ha Noi. Zenith Yoga offers a huge selection of vegan and vegetarian food – both Western and Vietnamese. It’s a little more expensive than most of the restaurants on this list, but their focus is on fresh, local and organic food cooked with minimal oil, so you can be sure of a healthy tasty meal. The vegetarian pho at Zenith Yoga Cafe is tasty and actually vegan! Photo by Zenith Yoga Cafe. Stop in for the lunch special which includes the main of the day, a smoothie and a cookie for 150,000 VND. Not that easy to find, La Studio is on the second floor of a building along one the narrow alleyways in Hanoi’s Old Quarter. Head up the stairs which appear to be taking you into an apartment building. Once you reach the second floor, look to your right. You should see a sign saying “La Studio”. When we arrived, everything was locked up tight, but, once we got her attention, a young woman sitting on the floor there let us in and gave us menus. I loved the atmosphere at La Studio; it is a wonderful place to take a break from the busy streets below and get a glimpse into the life of Hanoi locals. The small menu features a few vegan smoothies, hot drinks, and a couple of baked goods, which change depending on the day. We had the vegan brownie which was a nearly perfect. 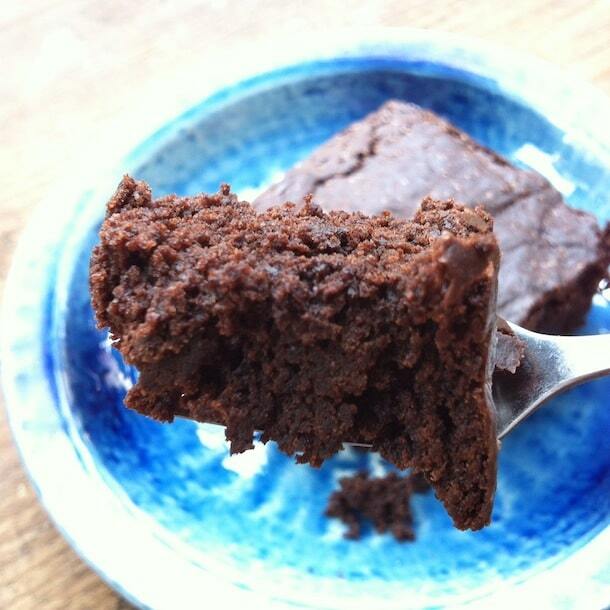 Yeah, this brownie from La Studio Vegan Cafe is as good as it looks. When it came time to pay, we could not find the woman who had served us, so we just left the money on a stool by here door. We hope she got it, because we definitely want to go back. This little vegan restaurant is hidden down an alley in the Old Quarter, but they are supposed to be opening a branch right on touristy Hang Gai, so soon it will be hard to miss. Update: The new location of Minh Chay is now open and looks like it’s becoming extremely popular. I stopped in one evening for dinner and it was completely empty except for me. That’s OK, I thought, I’ll try it anyway. After looking at the menu, which was comparatively pricey and full of weird dishes that I didn’t understand (even after having travelled the world for the last few years) I got up and left. A couple of nights later, I saw that the place was almost full, so perhaps I was too hasty? If you’ve eaten there, or if you go there, let us know in the comments. This is another place I have not been yet, since I’m not a huge fan of mock meats and budget Buddhist vegan food. But, if you’re hankering for a Vietnamese vegan meal in Hanoi, go check it out. Please come back and let us know if you eat there! This no-frills hole-in-the-wall specializes in noodles with beef, as the name suggests. However, many reviews say that the vegetarian option is actually vegetarian (or a least vegetarian + fish sauce) and that the broth served with the noodles is not made from meat stock. I had a minor challenge being understood when I asked for Bun Chay here, so practice your pronunciation of “tôi ăn chay” before you go. Some of the staff speaks English, so “vegetarian” might be more effective. After being served a bowl of meaty delights (sad face), it was quickly swapped out for a veggie bowl once I got the message across. Vietnamese Bun may be my favourite meal in then entire world, and I was thrilled to dig into the hearty and delicious noodle bowl, topped with handfuls of peanuts, cilantro, and fried shallots. 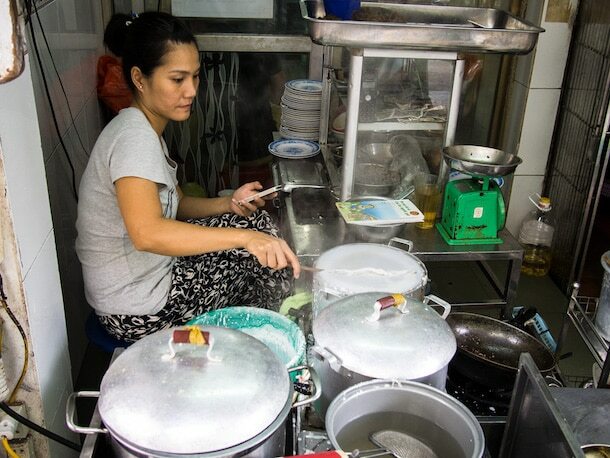 The sauce at the bottom of the bowl did not taste like it came from meat – more likely it is a mixture of fish sauce, lime juice and sugar, which is typical in Bun Bo. This became my go-to Hanoi restaurant when I wanted a tasty budget vegetarian meal. If you want a heaping bowl of noodles without the hassle of negotiating a beef option, wander down to Noodle & Roll. They have a decent-sized selection of vegetarian options, but my favourite is their satisfying Bun Chay. Like most Bun bowls, it’s topped with fresh veggies, herbs, and crushed peanuts, but it also comes with deep-fried puffy tofu. I could happily eat this every day. The also to a decent vegetarian pho. Update: After travelling in the south for several months this year and searching for a decent Bun Chay everywhere, I really started to miss Noodle & Roll. It’s the best one I’ve had in Vietnam. This Aussie-owned cafe is a great place to go if you’re looking for a quiet escape from the Old Quarter’s frenzied streets. It has a range of veggie and vegan selections, including lots of breakfast options, pasta and curry dishes, and even a few fresh salads. Say yes to the vegan salads, curries, and pastas at Hanoi Social Club. Photo by Hanoi Social Club. The mango curry with brown rice didn’t look like much when it came, but it was surprisingly delicious. The brown rice was just on the right side of chewy and the curry had a subtle flavour that really let the taste of the vegetables and rice come through. Though I was worried that the tempeh reuben would be a pale imitation of the amazing ones you can get in LA and Portland, it was amazingly delicious. It’s served on thick slices of perfectly grilled bread and stuffed generously with sauerkraut and grilled tempeh. The Leafy Greens salad is the perfect antidote to Vietnam’s general lack of fresh vegetables, being served with lots of spinach, sliced cherry tomatoes, grilled tomatoes, and huge pieces of avocado. I also loved the big basket of spiced tofu chips I ordered one day when I had been there for three hours and was starting to feel like I had overstayed my welcome. Who knew tofu could taste so moreish? After four visits, this gets my vote for the best restaurant in Hanoi Old Quarter to eat, work, and drink. I went back to Aubergine several times, more out of convenience than a desire to sample more of their food. They have decent basic tofu and eggplant dishes, which aren’t out of this world, but they’re pretty good for a quick meal. My favourites so far are the caramel and lemongrass tofu and the sesame encrusted eggplant. Aubergine’s location in the Old Quarter means you’re likely to be staying close by and you’ll probably end up there out of convenience too. Possibly one of the most popular tourist restaurants in the Old Quarter, New Day serves standard Vietnamese food á la carte or as a set menu. They have a page of veggie dishes on the menu and also a vegetarian set meal. While I wasn’t that excited by my stir fried veggies or the tomato tofu I had there, it is a good place to go for a quick, cheap, and easy vegetarian meal in Hanoi. Judging by the prices and the run-down appearance, MUM looks like it would cater to locals, but it is always full of foreign tourists. They only offer four veggie dishes, but of the three I’ve had, they’ve all been tasty and inexpensive. The vegetarian Banh Cuon, while not as good as the one I had from the street stall in the French Quarter, is filling and flavourful, while the coconut rice, which comes loaded with puffy tofu, veggies, and pineapple makes a satisfying meal (with room left for dessert). The service is below par here, but for the price, you can’t beat MUM for a quick veggie meal in the Old Quarter. Because I don’t really do cheese and the prices are a little outlandish for Hanoi, I haven’t eaten here. But this pizza place gets rave reviews and is supposed to have authentic thin-crust pizza with lots of options for vegetarians. If you eat at Pizza 4Ps please comment below and let us know how it was. Update: There are now two locations of Pizza 4Ps in Hanoi and at least one in Ho Chi Minh City. Since the restaurant scene in Hanoi changes in the blink of an eye, you’ll need to know how to find your own Hanoi vegetarian food when you visit. Happy Cow isn’t very complete for Hanoi, but they are a good starting point for your search for vegetarian food in Hanoi. I found most of my meals by looking at the popular restaurants on Trip Advisor and then searching within the reviews for each restaurant for the word “vegetarian”. This will quickly show you if other vegetarians have eaten there and what they thought of it. Just walk down the street and keep your eyes open for “vegetarian food” signs! Learn the useful phrases “Tôi ăn chay / I eat vegetarian” and “Không thịt / without meat”. One of the best ways to explore a food culture is by joining a local cooking class. There are plenty of fabulous cooking classes in Hanoi, and most of them offer a vegan version! Hooray! During the hugely popular Chef Duyen’s Home Cooking Class, you’ll get to explore local markets and chat with locals as they go about their day. In the 5 Dishes Traditional Hanoian Cuisine Cooking Class, also very highly rated, you’ll learn to cook the 5 most important dishes in Vietnamese cuisine. Both tours offer a vegan menu option! We only recommend tours from a few selected travel partners whose companies we know and love. While we haven’t done these tours ourselves, we would jump at the chance to join them! There are so many hidden places to eat amazing vegetarian food in Hanoi and the best way to find them is on a street food tour. On this tour, you’ll learn where to find the best street food and hole-in-the-wall places in Hanoi – and vegetarians are totally welcome! If you’re visiting Hanoi, you’ll almost certainly want to see Halong Bay, too. Sure, it’s touristy but it’s also incredible! You’ll get to spend a night on a Halong Bay junk, soak up the incredible atmosphere, and kayak into hidden caves. These are our favourite tools and companies for planning and booking your travels in Asia. We have used all of them and recommend them for their dedication to providing you great travel experiences. The guide includes a map and addresses of all the restaurants I’ve mentioned in this post. It’s super handy to have as you wander the twisty streets of Hanoi! Give us a shout if you end up eating at any of these places or find amazing vegan and vegetarian restaurants in Hanoi that we didn’t mention. We’d love to hear from you! Thanks for your great article. We are looking forward to see in Hanoi again . Thanks guys. We look forward to visiting Hanoi again soon! Pingback: Is solo travel in Vietnam right for you? Find out now! | My Five Acres. Travel. Adventure. Yoga. The first time I was in Hanoi I did a Food tour of the Old Quarter. You can do the walk at lunchtime or in the evening, and make sure that you are really, really hungry, otherwise, you miss out on a lot of good food. It was a lot of fun, the food was tasty, and a treasure trove of information. Ha, so true. There was no way I could eat everything on our food tour! I should have paced myself from the start, only eating half-portions, but all the food was so good I couldn’t stop myself. Thanks for your comment Ventori! 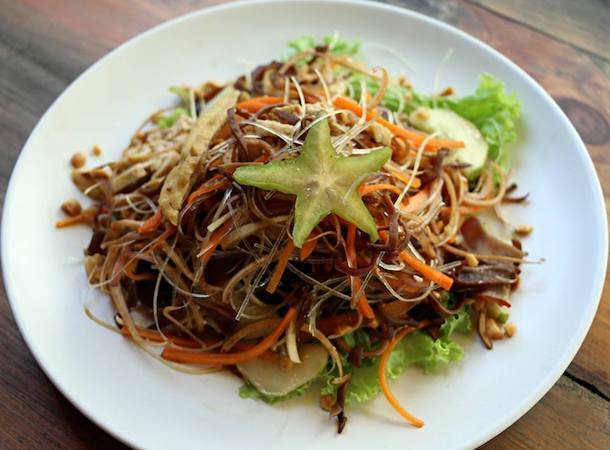 Pingback: Your Guide to the Best Vegan and Vegetarian Restaurants in Hoi An | My Five Acres. Travel. Adventure. Yoga. Pingback: Hue Vegetarian Restaurants: The Best City for Vegan Food in Vietnam? | My Five Acres. Travel. Adventure. Yoga. Pingback: 15 Things You Need to Know to Survive as a Vegan in Vietnam | My Five Acres. Travel. Adventure. Yoga. 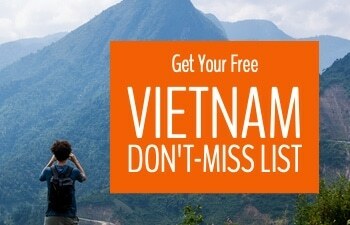 I’m not vegan and not vegetarian but am going to Vietnam for the first time in May and am very fussy if I do eat meat. I don;t think I can trust meat served to me there to be at a standard I am happy with so will probably be eating vegetarian for sure, should be clearer what I am actually eating then. 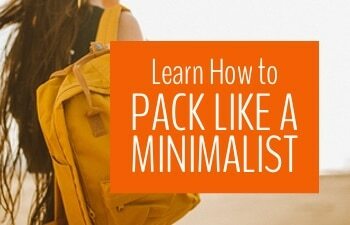 I found your travel tips very helpful. My main question is, while holidaying in Bali with my vegan daughter I ate the most delicious dragon fruit smoothie bowl/acacia bowl. Did you come across any good places in Hanoi or other parts of Vietnam where I can get this dish when I am there? Lots of people go vegetarian (or at least partially vegetarian) when they travel to Southeast Asia. It certainly is easier to keep track of what exactly you’re eating that way – if you go to a few Vietnamese markets, you will see how the meat is stored and sold and it will probably convince you to be meat-free while you’re there! Vietnam doesn’t have the same type of food scene as Bali at all. 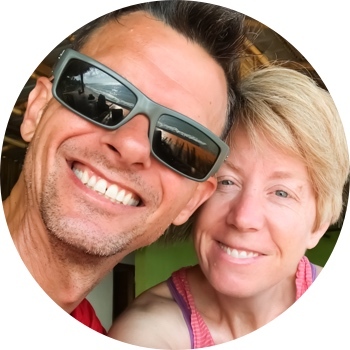 Bali’s food scene is very based on the wellness/yoga vibe that has developed there, so a lot of their food ideas have been imported from Australia and the West. 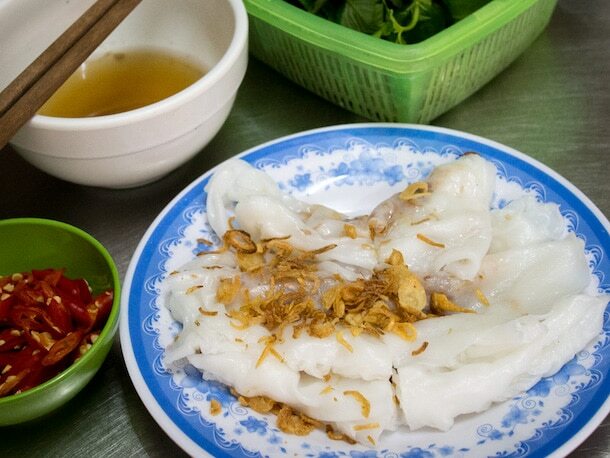 In Vietnam, it is more local-style food plus a few backpacker staples, like banana pancakes. So no, not much in the way of healthy smoothie bowls and the like in Vietnam that I can think of. You can get smoothies, but most of those have a bunch of condensed milk and sugar in them. They are delicious but not necessarily good for you! Let us know if you find any that we don’t know about! Thanks for the comment Anne! I never thought one of my posts could help out a local – but you don’t have to worry because the vegan scene in Vietnam just keeps growing. Plus, speaking the language would be a big help :). The hardest part about going home as a vegan is to explain to your family and get them to stop urging you to eat some meat / egg / milk etc. You’re welcome. Thanks again for the tour! All of those look interesting and delish! Thanks Casey. They are definitely interesting and many are delish! I’m still getting used to a lot of the strange-tasting herbs they add to the food here, but am starting to like them a lot!